Pad A of Launch Complex 39, shortly before a launch. The Mobile Service Structure is parked back by the crawlerway, the crawler separated, and only the Mobile Launcher is on the pad with the vehicle. At last everything was coming together - all those elements that had been committed piecemeal - the command module in Apollo 7, the first manned flight away from the bonds of Earth in Apollo 8, the flying of the lunar module with men on board in Apollo 9, and then Apollo 10, which went to the Moon and did everything short of landing. It all led up to that hot July morning in 1969, when Apollo's moment of truth was irreversibly upon us. Uncounted things had to be done before we reached that moment. Before the operational phase even began, we had to pass through the conceptualization and construction phase, remembering something Jim Webb once said, "The road to the Moon will be paved by bricks and steel and concrete here on Earth." For Apollo we had to build Complex 39 at a cost of half a billion dollars, that is, we had to finish Stage Zero, before we could proceed to Stage One, the flying of the birds. Complex 39 was to Moon exploration what Palos was to Columbus: the takeoff point. Man had never attempted any such thing before, and I wonder when he will again. Everything was outsize - among the impressive statistics about the core of Complex 39, the Vehicle Assembly Building, were its capacity (nearly twice as big as the Pentagon) and its height (525 feet, thirty feet short of the Washington Monument's). During 39's construction phase we were, of course, flying Saturn Is - ten of them - and in 1966 three Saturn IBs, all from Pads 34 and 37. Everything - launches and construction - had to mesh; it was like building a thousand different homes for a thousand demanding people. 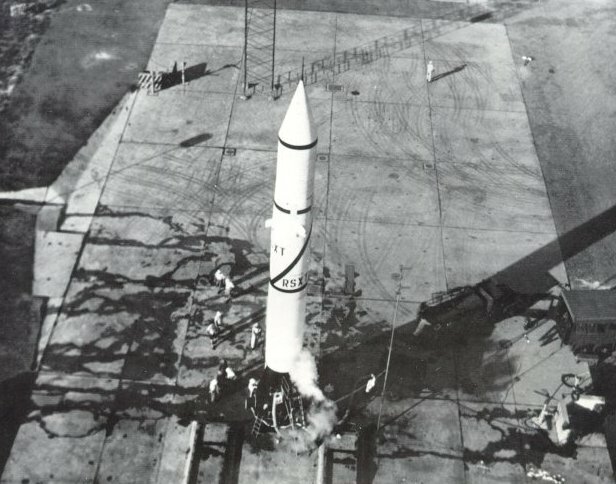 It was on the last of these IBs that I made my rookie appearance as director of launch operations, August 25, 1966. The mission was a 1 hour 23 minute suborbital flight to test the command and service module subsystems and the heatshield. CM 011 was recovered near Wake Island in good condition; its shield had withstood the heat of reentry at 19,900 mph. During the construction phase of Complex 39 (1961-66) I was Apollo Program Manager at the Cape. The first thing we had to do was decide where to build the moonport. My boss, Dr. Kurt Debus, and Maj. Gen. Leighton Davis, USAF, were directed to find a place from which to launch huge vehicles like the projected Nova or the Saturn V - Cape Canaveral's 17,000 acres weren't nearly large enough. In this study we considered sites in Hawaii, the California coast, Cumberland Island off Georgia, Mayaguana Island in the Bahamas, Padre Island off the coast of Texas, and several others. Eventually we concluded that the most advantageous site was Merritt Island, right next to the Air Force's Cape Canaveral facilities, which had been launching missiles since 1950 and NASA vehicles since 1958. Our report was completed July 31, 1961, and we spent all night printing it, after which Dr. Debus and I flew up to Washington and briefed Mr. Webb and Dr. Seamans. So 84,000 acres of sand and scrub were acquired for NASA by the government, plus 56,000 additional acres of submerged lands, at a total cost of $71,872,000. We lost no time in raising the curtain on Stage Zero. No one who was involved can ever forget the driving urgency that attended Apollo. Nor the dedication of those who worked on it, including the construction crews, who by 1965 numbered 7000 persons at the Cape. A launch pad looked different in the early days at the Cape. 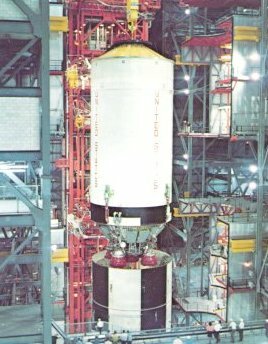 Here Redstone 4 is in final stages of preparation in August 1954. The plume of vapor at the base is oxygen boiling off, a hazard being ignored by the men at work; but the presence of an ambulance suggests awareness that all might not necessarily go well. Central sections of the deployment track are concreted, to keep exhaust gases from tearing up the pad. This launch was successful. John F. Kennedy Space Center, on Merritt Island across the Banana River from Cape Canaveral, was acquired because the Air Force's launch complex at Canaveral did not provide the area needed for the Apollo program. At one time we had considered preparing the space vehicle horizontally, and then erecting it vertically on the pad, but this was simply out of the question for a 360-foot bird. So we had to erect the Saturn V stage by stage, which meant that, because of rain and wind, we had to have an enclosed building. Even a 10- to 15-knot wind would have given us trouble while we were erecting outdoors, and higher winds could prove disastrous. Thus the Vehicle Assembly Building became an enclosed structure. Should the high bays be strung out four in a row, or built back-to-back? We decided on the latter format because only two big cranes (250-ton bridge cranes) would be needed instead of four, and because the box-like structure would better withstand hurricane winds of 125 mph. The possibility of hurricanes also dictated that we have two crawlers, one to carry the Mobile Service Structure away from the pad, and one to bring the Apollo-Saturn V and its Mobile Launcher to shelter in the VAB. The height of the building was dictated by the hook height, and we started planning for 465 feet; the final height was 525. Remember that when we started planning the VAB in 1961 we weren't sure what size bird would roost in this big nest. We also had to begin design work before we knew whether the trip to the Moon would involve an Earth-orbit or lunar-orbit rendezvous. I think of the VAB not as a building but as an intricate machine that assembled the vehicle in its final phases. People were surprised to learn that the various stages had never seen each other until they were introduced in the VAB drydock. The first stage had been built by Boeing at Michoud outside New Orleans, the second stage by North American at Redondo Beach, Calif., the third by McDonnell Douglas at Huntington Beach, Calif., and the Instrument Unit by IBM at Huntsville, Ala. The spacecraft that went on top of this stack were also introduced for the first time in the VAB, the CSM from the North American plant at Downey, Calif., and the LM from Grumman in Bethpage, Long Island. Could these pieces, arriving from all over the country, play together? Every wire in every plug had to join exactly the right wire, with no electrical interference or change of signal strength, and a command signal had to work from the Instrument Unit through the third and second stages into the first. After the various stages had been put together they had to be checked out as an entity, and once this had been done you naturally don't want to break the electrical connections again. When the Instrument Unit orders "Go right", you don't want an engine three stages down to go left. The pieces not only had to match each other, but also the ground equipment. Lines for the flow of liquid hydrogen from the ground had to match the stages, and so did others for the flow of liquid oxygen and still others for gaseous nitrogen and helium. Television monitors had to be designed and installed so that we could know what was happening in hundreds of places at any given time - which meant all the time. 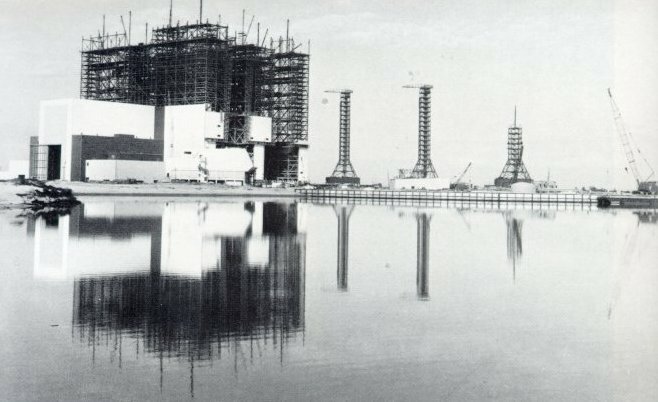 The Vehicle Assembly Building - an "intricate machine" to put rockets and spacecraft together - took shape early in 1965. In the foreground is the turning basin for barges to bring in giant rocket stages. At right three big Mobile Launchers are also abuilding. 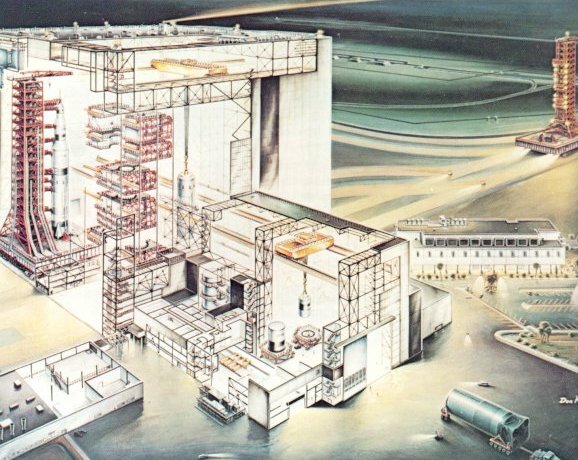 In this super-barn, launch vehicles and spacecraft were delicately built up, interconnected in myriad ways, and then exhaustively checked out for any mismatch. The skill required of the technicians working within Complex 39 - and throughout the Kennedy Space Center - had to be fine-honed. One of the legends had it that the crane operator who set the 88,000-pound second stage on top of the first stage had to qualify for the job by lowering a similar weight until it touched a raw egg without cracking the shell. Of the Cape's 26,500 workers - the peak number in 1968 - a high percentage were men and women who possessed such skills. One can speculate whether such a crew is likely to be assembled in one place again. The pads of Complex 39 were abuilding at the same time the VAB rose on its 4225 16-inch steel pipe pilings that had been driven more than 160 feet below the sandy surface into bedrock. Pad A and Pad B were twins, each occupying about 160 acres; we had also planned a Pad C, which explains why the crawlerway from A to B has an elbow-like crook in it - the elbow would have led to C. (We even had a contingency plan for a Pad D in case launchings became more and more frequent.) The pads were built 8700 feet apart so that an explosion could not wreck more than one of them. 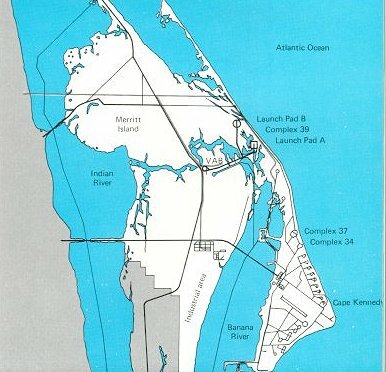 They were located three and one-half miles from the VAB and the Launch Control Center. In the early days we'd had to control a launch from a site close to the pad, to avoid electrical problems induced by a longer run of electric cabling, which in turn meant that we worked from a blockhouse heavily protected against fire and blast. Now, by the time the Saturns were ready, digital data technology had advanced to the point where firing rooms could be in a structure miles away. How to get the Apollo-Saturn V from its birthplace in the VAB to the pad from which it would fly for the first and only time in its life? Early in the program we considered moving it on its three and one-half mile journey by water. The barge concept was deep in our thinking: the first and second stages had to come to the Cape from Louisiana and California, respectively, by man's oldest form of transportation, since they were too large to go through tunnels or under bridges. On this short trip why not also float the Saturn V and its Mobile Launcher standing upright on a barge? We got the Navy to run tests at the David Taylor Model Basin in Washington, which showed that the hydrodynamic requirements of such a topheavy barge would be too demanding. We looked into a rail system, into pneumatic-tire transporters, and ground effects machines but all were impractical or too expensive. 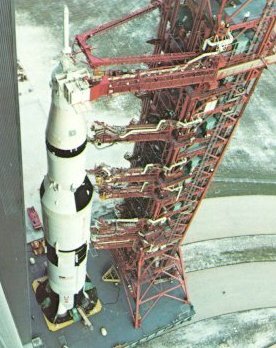 Lowering the second (S-II) stage of a Saturn V to mate with the first stage, which is already standing on the launcher. Here the camera is about 200 feet up in a high bay of the Vehicle Assembly Building. Looking down at the space vehicle as it leaves the VAB on the base platform of the Mobile Launcher. The nine swing arms that run from the launcher's tower to the vehicle's various levels are in extended position. Then somebody in our shop came up with the idea of using giant tracked machines like those used in strip mining. What evolved was the unique crawler or, more politely, transporter. As built by the Marion Power Shovel Company, the crawler took shape with eight tracks, each 7 by 41 feet, with cleats like a Sherman tank, except that each cleat weighed a ton. 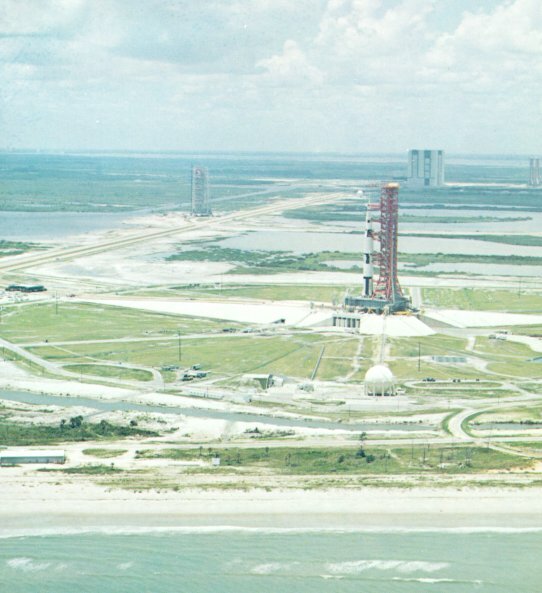 Mounted over these eight tracks was the platform, bigger than a baseball diamond, on which the Apollo-Saturn V and its Mobile Launcher would ride majestically from VAB to pad at one mile per hour. The package weighed 9000 tons, two-thirds cargo, one-third crawler. If that sounds easy, it wasn't. In July 1965, during a test, some bearings cracked because we had assumed the weight would be equally distributed on various parts of the crawler. We were wrong. The bearings, incidentally, were ten inches in diameter and there were eleven sets of them. This problem was met by changing from roller bearings to sleeve bearings; we also topped off the crawlerway with eight inches of Alabama river rock to distribute the load evenly and to relieve friction at the turns.